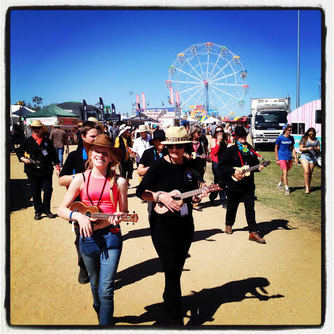 The Deniliquin Uke Muster has been rocking four strings since 2011. We are an eclectic bunch who get together every Wednesday night (during school term) at the Deniliquin Club to play, sing and learn. Led by experienced guitar tutor and local legend Chris Bodey, we thrive under his benign 'christatorship' as he keeps us in line and never gives up on trying to teach us new things. If only we would all practice a bit more regularly, his life would be complete. Want to join us? Contact us using the form below. If you live in Deniliquin, chances are you will have seen us play. Whether its down the main street in a flash mob, at the local farmer's market or bowling club or on stage at the Deniliquin Ute Muster (the other one) or the Deni Blues and Roots Festival, we can put together a show. We love to perform and we are not shy. We have also taken the occasional road trip, visiting and playing in Beechworth, Albury, Yackandandah, Millawa, Balranald, Bendigo, Castlemaine and even a steam train to Maldon. Want us to play for you? Contact us via the form below.